Paella marisco, or seafood paella is one of the most popular food traditions of Spain. Brian from Seafood City recommends using Saltspring Island mussels - a sweet and delicately flavoured mussel. In a large bowl, rinse the rice 4 times with cold water. The rinse water will start out looking opaque and milky, by the 4th rinse it should be running almost clear. Over medium-high heat in a heavy large pot, sauté bacon until the fat is rendered. Remove bacon and set aside. Reduce heat to medium. Salt and Pepper the chicken thighs and brown the chicken, about 7-10 minutes. Remove chicken and set aside. Add onions and garlic and sauté until golden. Scrape up any browned bits from the bottom of the pot. Add the rice, pimentos and saffron and stir together. Add the clam nectar and chicken stock and bring to a boil. Remove from heat. In a paella pan, or a 15x10x2 baking dish add the rice mixture and arrange chicken in the rice mixture. Sprinkle the bacon and the green bell peppers over the top. Cover with foil and bake in the oven for 30 minutes. 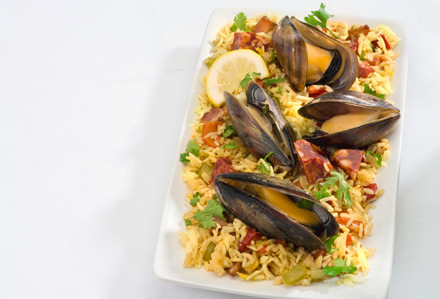 Remove from oven, add the mussels to the dish, re-cover with foil and bake for an additional 10-15 minutes, or until the mussels open and the rice is tender. Remove from oven and let stand uncovered for 10 minutes.